As a UC Davis student, you’re on a quest to discover and innovate. Along the way to knowledge and change, you’ll put in countless hours of studying. Why not spend them in one of these eight campus spaces poised to enhance collaboration, reflection and creativity? 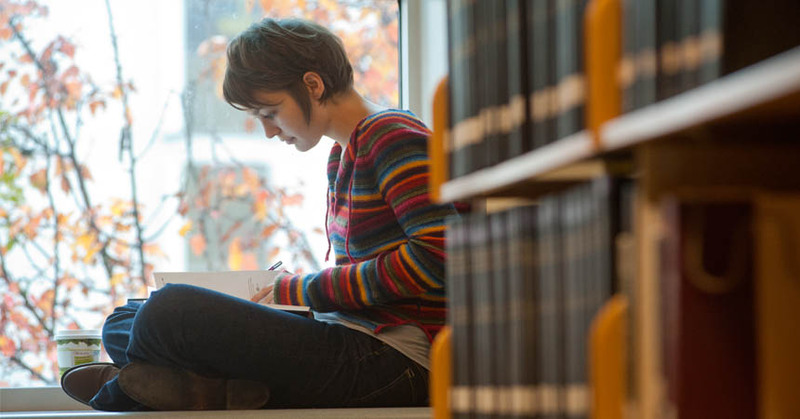 Close the book on conventional libraries — the Peter J. Shields Library is a hub at the center of campus and a treasure trove of unique study nooks. From the airy main reading room to the quiet outdoor courtyard, and reservable group study rooms, tried-and-true individual carrels and countless wide windowsills on which to perch with your laptop or books, our library can suit your many study styles. 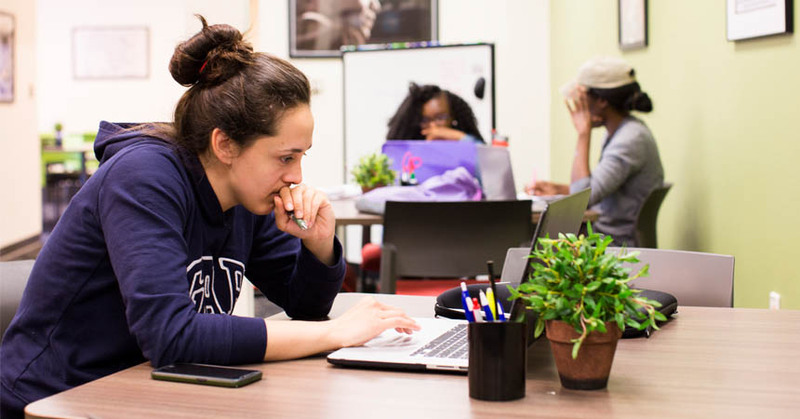 Voted the best place to study by students in 2016, the library is only getting better: Therapy Fluffies and now the CoffeeHouse visit around finals, and a bold re-visioning plan will bring new furniture and new technology in the near future. 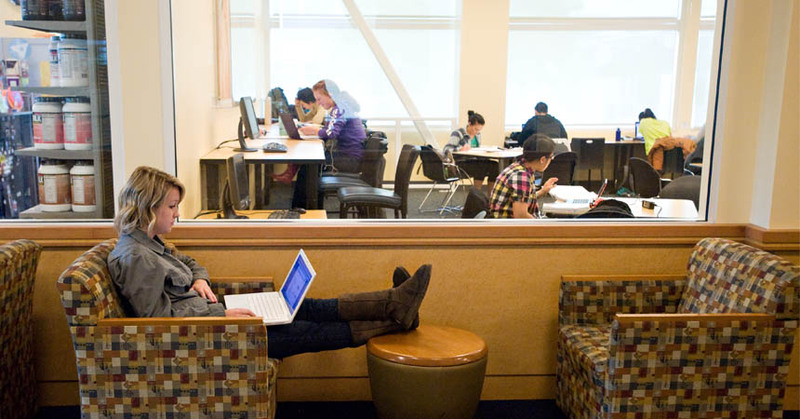 This fall quarter, from Sunday, Dec. 10, to Wednesday, Dec. 13, the library will open new sections for 24-hour use, namely the Sally Porter, Main Reading and Nelle Branch rooms. These rooms will be patrolled by security for student safety. And you can snack! The library is partnering with the CoHo to have coffee, tea, packaged baked goods, energy bars and fresh fruit during finals. You can get that caffeine and sugar boost 5 p.m.-10 p.m. Dec. 8-10, and 7 p.m.-midnight. Dec. 11 – 14. UC Davis takes your wellness to heart — just visit the campus Activities and Recreation Center (ARC) to experience firsthand how physical activity can help you focus. Stimulate positive energy by breaking a sweat on the mat or court, or build a workout seamlessly into your study sessions by bringing your books with you. With its tables and couches, and snacks at the ProShop and Starbucks, the ARC is fully equipped to strengthen your body and brain. 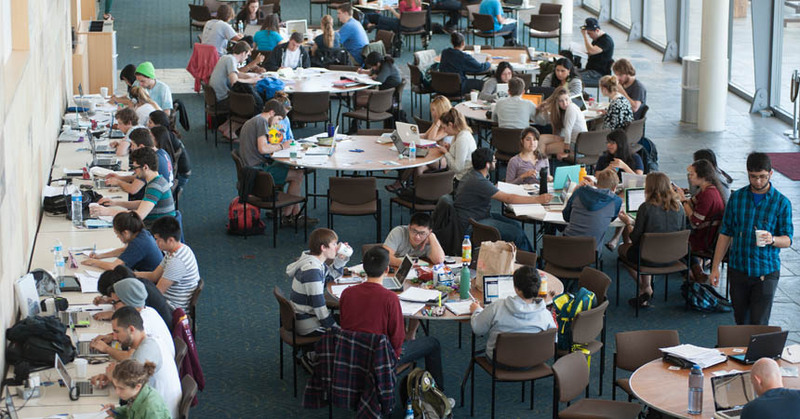 The Student Community Center (commonly called the SCC) is a great place for community — and for cramming. The building’s lobby is open until 2 a.m., and lights by meeting room doors light up green when the rooms are available, making collaboration efficient for you and your team. So study away, then skip the line to get your Scantron or blue book — the SCC has a vending machine stocked with them on site. There’s an art to succeeding in college, isn’t there? You can master it by basking in the natural light and grand views in the three levels of open seating at the Robert and Margrit Mondavi Center for Performing Arts. The expansive lobbies are open weekdays, with a food truck right outside. 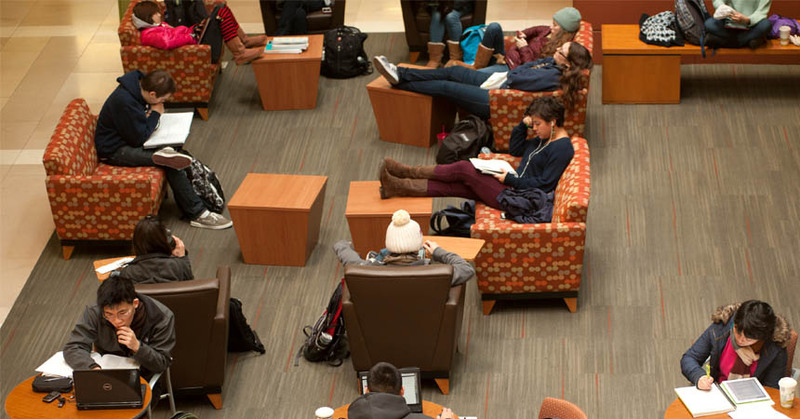 Keep close watch during finals week because the center turns into the best kind of study hall: large tables ideal for group work, plenty of outlets for your devices, classical music streaming in the background, and freely flowing coffee and tea. 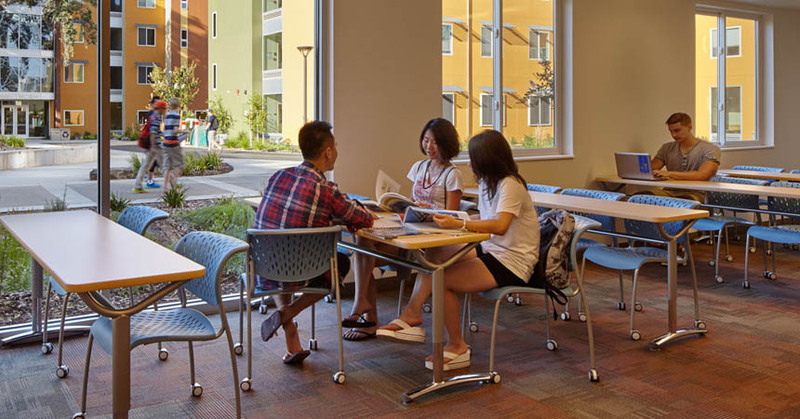 Each residence hall has a common area study lounge open all day and all night during the academic year, so inhabitants can be supremely comfortable and seriously studious at the same time. Just a few steps or doors away from bed are tables, chairs and couches, outlets and even whiteboards for your use — bring your own midnight snacks. If a computer, printer or scanner is what you need, you can find those in the residence hall’s computer center, also open all the time, every day. Intimate yet social spaces, the student resource centers provide supportive structure for dialogue. Some student scholar organizations sponsor study events in the evenings — check the Center for African Diaspora Student Success; AB540 and Undocumented Student Center; Lesbian, Gay, Bisexual, Transgender, Queer, Intersex, Asexual Resource Center; Cross Cultural Center; Student Recruitment and Retention Center and Women’s Resources and Research Center for offerings throughout the year, and delve into the digital homes of various Latino/a and Chicano/a, Native American and Middle Eastern student resources. 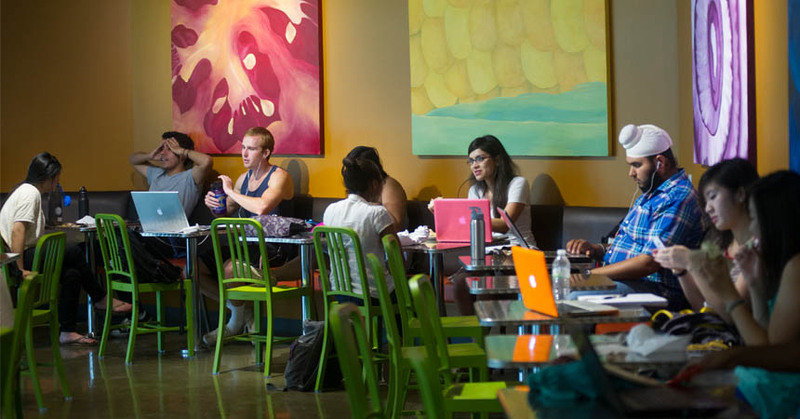 A coffeehouse on campus — need we say more? The ASUCD CoffeeHouse in the Memorial Union is run for students by students (with a handful of other staff). That means friendly faces, special attention to sustainable practices, and a wide variety of offerings and hours tailored to your study needs. Let your thoughts expand from a grassy seat on the bank by Spafford Lake in the UC Davis Arboretum. It’s just one of the 17 different gardens and collections in the “living museum” along Putah Creek. 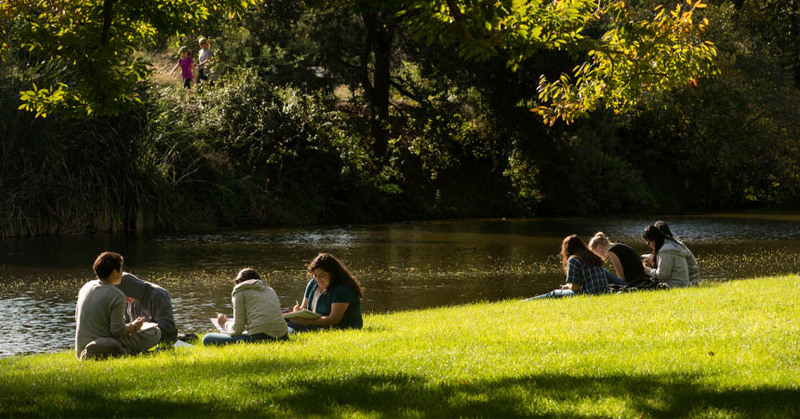 If the serene surroundings get you daydreaming, you’ve learned quickly that the Arboretum, and several other campus spots, have a place on the UC Davis Nap Map from Student Health and Counseling Services.